DJI, the world’s leader in creative camera technology, has introduced Ronin 2, the three-axis camera stabiliser redesigned to give filmmakers the freedom to capture any scene they can imagine. Based on DJI’s transformative gimbal technology, Ronin 2 has more power and torque to carry larger cameras, is more versatile to be used in every situation, and has more intelligent features to allow for unprecedented camera moves that help realise every creative vision. Ronin 2 gives filmmakers complete freedom to select the right camera for the shot. An enlarged camera cage and 50mm extendable arms support everything from DSLRs to full cinematic cameras and lenses. Powerful gimbal motors ensure sufficient torque to handle payloads up to 13.5kg. Aided by onboard GPS, the powerful encoded motors let Ronin 2 travel at speeds of up to 75 mph while delivering the same 0.02 degrees of sub-pixel level precision that Ronin users have come to expect. With a new design and detachable Grip, Ronin 2 brings custom stabilisation to the full range of camera mounts that directors rely on. From basic handheld and jib configurations to Ready Rig, plus cable cams, vehicles and drones, Ronin 2 provides a wide range of creative flexibility. 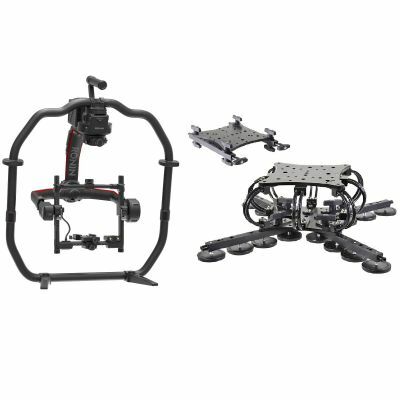 A new two-axis operation mode for mounting to Steadicams offers unique and creative movements that were once impossible to perform. The quick release mount makes it easy to transfer seamlessly from one scene to the next, giving filmmakers new freedom to explore every perspective with stability and control. A redesigned dual band 2.4/5.8 GHz remote allows minimized interference for full control during remote and two-person operation at a range of nearly 1.5 kilometers. Every detail of Ronin 2 has been improved for quick setup and easy operation. New axis locking levers and fine tuning knobs deliver faster and more precise balancing, while the Auto Tune Stability feature intelligently adjusts motor parameters for optimal use in seconds. A new integrated touch screen with 1,000 nits of brightness lets professionals directly configure the gimbal settings for on-the-fly adjustments and for full control of mounted RED cameras. Ronin 2 features a redesigned carbon fibre monocoque style frame, providing the highest quality manufacturing ever in a handheld stabilised camera rig while making the platform durable, lightweight and easy to carry. New fold-away feet enable the operator to set the platform down during handheld filming without the need for a separate stand. A splash-proof enclosed motor design with internally routed power, SDI and data cabling enables worry-free shooting in the most demanding environments. Integrated power and data ports make Ronin 2 a centralised system for cameras and all accessories without the need for multiple power systems. It features four 14.4-volt (8 amps total) ports near the camera cage, two 12.6-volt (4 amps total) ports near the pan motor, and one P-Tap 12.6-volt (4 amps) outlet on the battery mount. Dual hot-swappable batteries provide continuous uptime without ever powering down. They are capable of operating simultaneously and independently to provide 2.5 hours of runtime to power the gimbal and a RED Dragon camera. Ronin 2 uses the same ultra-fast charging, high-capacity, self-heating batteries as the DJI Inspire 2, simplifying battery management and guaranteeing reliable power in extreme cold temperatures down to -20 degrees celsius. The battery system is fully detachable to provide a portable power supply for any 12-volt P-Tap powered camera or accessory. The completely updated DJI gimbal assistant mobile app provides a more intuitive and easier-to-use interface for bringing a cinematic vision to life. It includes new studio-oriented functions to easily capture complicated camera moves that once required specialised expertise or additional equipment. The new Panorama mode automatically controls Ronin 2 to create still image panoramas that account for the camera sensor type and lens focal length as well as the user-defined overlap rate. Its new Timelapse mode can program multiple movements and camera actions at different points along a route, and view progress in real time. And the new CamAnchor mode lets operators quickly record a preferred gimbal orientation at particular locations, then revisit them with a simple touch as the camera moves from point to point. The intelligent SmoothTrack system that provides stable images while the camera is on the move has been enhanced with an updated algorithm for keeping Ronin 2 in sync with the operator’s movements. For every scenario encountered by a professional camera, Ronin 2 users can fine-tune how their rig responds to new movements along all three axes.